a. Separately circulating them in adjacent spaces. Surface heat transfer is defined as heat flowing from a “hot” fluid through a tube wall or other membrane to another cooler fluid. Contact heat transfer is defined as heat flowing from a hot fluid to a cooler fluid due to mixing of one with the other. A heat exchanger is a device for transferring thermal energy from one medium to another. It generally consists of two channels or system of channels, one for each medium, and separated from each other by partitions through which heat is transferred from the hot medium to the cold medium. Most coolers used on board ship transfer heat from a hot fluid to sea water. For the main propulsion engine of the motor ship, the engine jacket water, lubricating oil and charge air must be cooled and generally also water or oil used in cooling the pistons. In a steamship, apart from the heat yielded to the main condenser, the turbine and gearbox lubricating oils provide the principal sources of heat rejected to the circulating cooling water. Auxiliary prime movers require cooling and air compressors have intercoolers and aftercoolers. 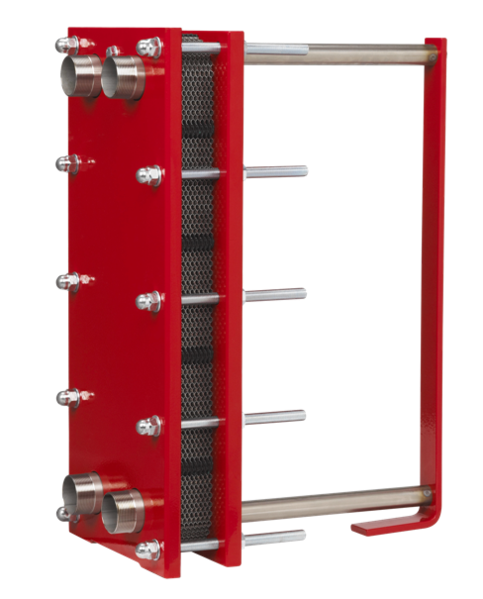 Steam heated heat exchangers include heavy fuel oil heaters, boiler air pre-heaters, units to heat sea water for tank washing, evaporators, feed heaters and calorifiers. The temperature of a hot liquid is lowered by transferring part of its heat to sea water. Heat from a hot gas or vapour is transferred to seawater to the extent that the gas or vapour liquefies. The temperature of a liquid or gas is raised by transferring heat energy from a hot medium, usually steam. Heat energy is transferred to a liquid until it evaporates (changes from liquid to gas). The division plates in the heads or boxes fix the position of the inlet and outlet branches for the fluid passing through the tubes. The internal baffles fix the position of the inlet and outlet branches for the fluid passing through the body of the heat exchanger on the outside of the tubes. If the heat exchanger heads do not contain any division plates, he fluid passing through the tubes enters at one end of the heat exchanger and leaves at the other. This arrangement is referred to as a single pass heat exchanger. If the heat exchanger is a double pass type, a division plate is fitted in one head. The inlet and outlet connections for the fluid passing through the tubes are fitted on this head. The division plate prevents the fluid bypassing and causes it to pass through half the tubes in the heat exchanger which is referred to as the inlet bank. After the fluid passes through the inlet bank it enters the other head which is just a bobbin piece and a cover. The direction of fluid flow is reversed in this head or box and it passes back through the outlet bank of tubes and leaves at the outlet branch. The fluid has passed through the tubes in two different paths from which it gets the name two pass, or double pass. In recent designs, the guided flow concept has been introduced, i.e. a secondary cooling surface in the form of radial fins integral with the tubes between which flow is guided radially, alternately out and in from section to section. This gives better heat transfer surface and better heat transfer, lower metal surface temperature and increase performance. Baffles. They have thermal significance because the shell-side fluid is made to flow to and fro across the bundle from one end of the heat exchanger to the other. Another importance of baffles is that they are spaced to provide support to the tubes and prevent sagging of tubes and flow-induced vibration. Depending on the size and duty of the cooler the cylindrical shell may be of fabricated steel, cast iron or occasionally aluminium bronze. The tube plates are usually of Naval brass and the tubes of aluminium brass; occasionally 70/30 copper-nickel tubes are used. The usual method of securing the tubes to the tube plate is to roll-expand them. The cooler headers may be of cast iron. In such instances the headers act as sacrificial anodes, wasting in preference to the aluminum-brass tubes. Unless soft iron or mild steel sacrificial anodes or impressed current cathode protection is used to protect the cooler from corrosion such headers should not be painted internally. Shell: Gun metal (copper, tin, zinc ); or cast iron. Tube plates: Cast naval brass ( copper, zinc, tin ). Arrangements for Linear Expansion of Tube Stack. Ø One tube plate expands, shell and tubes fixed. In heat exchangers with cast bodies, one tube plate is fastened to the flange on one end of the body. The other tube plate is made to slide within the end of the body. Sealing is effected by fitting O-rings in circumferentially cut grooves. The O-rings contact the circular bored end in the body and the tube plate to make a seal. When there is a difference in expansion between the tubes and the body the differences are accommodated by the tube plate which slides relative to the body. With this arrangement the tubes can only be arranged for single or double pass flow. This arrangement is more commonly used for engine cooling water and lubricating oil coolers. It also has the advantage of allowing very easy removal of the tube stack from the exchanger body for chemical cleaning or repair. This is further facilitated if the cooler is mounted vertically and the sliding tube plate is at the lower end. Ø Shell expands, tube plate and tubes fixed. 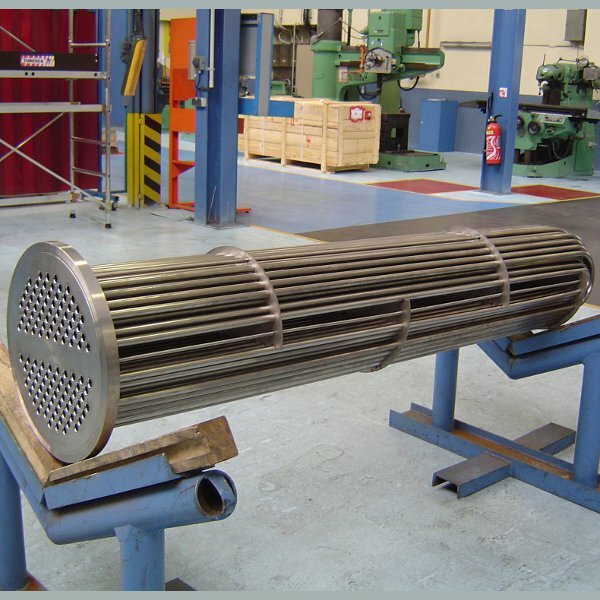 In some types of heat exchangers the body is made of mild steel plates, and in order to cater for the differential expansion between the body and the tubes, a bellows ring is welded circumferentially a round the body of the heat exchanger. Differences in expansion are then catered for by the bellows ring that deforms slightly to accommodate the changing length of the tubes. This type of expansion arrangement can be used for any number of fluid passes through the tubes.The tube plates are bolted directly onto the flanges of the body and the tubes may be roller-expanded at both ends. Ø Tubes expand, shell and tube plates fixed. A third arrangement is to fasten the tube plates to the shell of the exchanger and roller-expand and bell-mouth the inlet ends of the tubes. The outlet end of the tubes is fitted with a small stuffing box in the tube late and sealing is made by using cotton cord packing tightened by a threaded gland ferrule screwed into the threaded end of the stuffing boxes. Differences in expansion between the tubes and the exchanger body is accomodated by the tube ends sliding through the packing in the tube plate gland. This is a common arrangement for exhaust steam condensers. 1. Tubes expanded to the plates. 2. Gasket between end box(header) and shell flange. 3. O- rings between shell and free end of tube plate. Separation of the shell and tube fluids at the floating head is obtained by means of packing rings installed between the outside of the floating tube plate and recesses in the rear- head flanges. The shell and tube side fluids each have their own packing rings, which are separated by a lantern ring provided with weep holes for leak detection. Leakage at the packing will not cause mixing of the shell and tube side fluids within the exchanger itself. The width of the machined bearing surface at the flating tube plate periphery must accommodate the two packing rings, the lantern ring and thermal movements of the bundle. In some cases the pressure of thickness of floating tube plate is sufficient, but if not, the extra bearing width is obtained by providing a machined skirt at the tube periphery. The skirt may be an integral part of the plate or attached by welding. The basic plate consists of a thin, rectangular, metal sheet into which a corrugated pattern has been formed by precision-pressing. One side of each plate has a full peripheral gasket. The complete unit comprises a number of such plates, mounted on a frame, and clamped together, face to face, by a bolting system. The pace between adjacent plates forms a flow channel and the system is arranged so hat the hot and cold fluids flow through alternate flow channels, parallel to the long side of the plates. Openings(ports) in the four corners of each plate direct the two fluids into their respective channels. The most common metals use in plate type heat exchangers are titanium and stainless steel Others include titanium-palladium alloy and monel metal Carbon steel is rarely used because thin plates are required for pressing, which would have little corrosion resistance. Titanium provides very high resistance to corrosion by sea water. 1) Corrugations increase the effective area of the plate and promote turbulence. In he washboard type, turbulence is promoted by a continuously changing flow direction and velocity of the fluid. In the herringbone type adjacent plates are assembled such that the flow channel imparts a swirling motion to the fluid. 2) To enable such thin plates to withstand differential pressures up to at least 10 bar, and in special cases up to 25 bar, the corrugations are essential for strengthening and mutual support of the plates. The periphery of each plate is grooved to house a molded gasket, which are usually cemented in; some are ‘snap-on’ type. The gasket is designed to provide a tight joint without local distortion of the thin plate. The integrity of the complete nit depends greatly on gasket performance. Gasket materials range from nitrile rubber( maximum temperature of 135°C) to Viton(175°C) and compressed asbestos fiber(260°C). Compressed asbestos fiber gaskets, however, are not widely used. The frame consists of a fixed head or fixed frame at one end, and a movable head or pressure plate at the other. The vertical sides of both the fixed frame and pressure plates are notched at intervals to engage tie bolts which join the heads together. The pack of plates are compressed together as the tie bolts are tightened at the movable head end. A horizontal carrier bar at the top of the frame, and a horizontal guide bar at the bottom, are attached to the fixed head plate at one end and an end support column at the other. Every heat transfer plate is free to slide along both bars. The movable head plate is similarly notched and free to slide along both bars. The frame is normally constructed in carbon steel. The fluids enter the unit via ports located in one or both end plates. If both inlet and outlet ports for both fluids are located in the fixed head end, then the unit may be opened up without disturbing the external piping. This applies to single-pass arrangements, but with multi-pass arrangements the ports must always be located on both heads. This means that the unit cannot be opened up without disturbing the external piping at the movable-head end. The port entrance area is the weakest part of the plate because, unlike the peripheral gasket, the gasket in an adjacent plate is not supported by a corresponding one. Each traverse of either fluid from top to bottom of the pack, or vice-versa, is termed a pass. Usually, all passes have the same number of flow channels in each pass, but this is not always the case. Single- or multi- pass flow is possible. A single pass by both fluids provides counter current or co-current and two arrangements, termed loop flow, are possible. In the preferred arrangement, all four ports will be on the fixed head-plate, with the advantage that the pack can be opened without disturbing any external piping. 1) Plate coolers are smaller and lighter than a tube cooler giving the same performance. 2) No extra space is needed for dismantling (a tube cooler requires enough clearance at one end to remove the tube nest). 3) Their higher efficiency is shown by the smaller size. 4) Plates can be added in pairs to increase capacity and similarly damaged plates are easily removed, if necessary without replacement. 5) Inspection and cleaning is simple as is maintenance. 6) Turbulent flow helps to reduce deposits which would interfere with heat flow. 7) With titanium plates virtually no corrosion or erosion would occur. 1) In comparison with tube coolers in which leakage tubes are easily located and plugged, leaks in plates are sometimes difficult to find because the plates cannot be pressurized and inspected with the same ease as the tube coolers. 2) Deterioration of joints are also a problem; they may be difficult to remove and there are sometimes problems with bonded new joints. Tube coolers may be preferred for lubricating oil cooling because of the pressure differential. 3) Cost is another drawback; there are a large number of expensive joints on plate coolers and the plates are expensive. 1. Charge Air Coolers. These are finned-type tubular heat exchangers to provide for better heat transfer, since air is a poor conductor of heat.These coolers are normally rectangular in form. 2. Electric Machine Coolers. Some large alternators and electric motors are designed for operation with closed ci5rcuit air cooling. Heat must be extracted from the circulating air and, for this purpose, finned tube units are employed, inserted into the air ducting. Sea-water flows through the tubes, while the air passes over them, flowing between the fins. Spray baffles are usually fitted to these units so that, in the event of puncture of one of the tubes, sea-water will not low directly into the alternator or motor. 3. Oil Heaters. For burning heavy fuel oil in a boiler furnace, or a compression ignition engine, it is necessary to pre-heat it. Steam is used as the heating medium in fuel systems and lubrication systems. The type of heater used is multi-tubular; the tubes are bent into a U- shape and fitted with expanded ends into a single tube plate. The liquid head or box is fitted with a division plate in its middle so that the oil flow takes a two-pass flow. The oil enters the inlet branch of the liquid head, passes through one leg of the U, round the bend and leaves by the other leg. The division plate separates the inlet and outlet legs of the U-shaped heater tubes. The inlet branch is always on the lower side. Tubes are sometimes fitted with fins bonded to them(the oil flowing outside the tubes) and tubes fitted internally to promote turbulence in the oil flowing through them. The combustion air required for forced- draught boiler furnaces may be heated by the exhaust gas in order to improve the overall efficiency of the whole cycle. This may be carried out in a conventional heat exchanger, air passing outside the tubes and exhaust gas inside them. These are usually the shell-and-tube type construction, with a fully floating head. The sea water to be heated flows in several passes through the tubes, being heated by the condensation of steam in one part of the tube bundle and sub-cooling the condensate in another. Shell-and tube type condensers are used, sea water circulating through the tubes and refrigerant condensing in the shell. External fins to improve heat transfer are sometimes used outside of the tubes. A condenser is a vessel in which vapor is deprived of its latent heat of vaporization and so changed to its liquid state, usually by cooling at constant pressure. In a steam system, steam enters at an upper level, passes over rubes in which cold water circulates, falls as water to the bottom and is removed by a pump or flows to a feed tank. The tube arrangement provides for condensation with minimum loss of heat: the cooling water normally circulates in two passes, entering at the bottom. There are three basic ways by which the temperature of the hot fluid being cooled in a heat exchanger may be controlled, when the cooling medium is sea water. a) By by-passing a proportion of the hot fluid flow, the remainder being passed through the heat exchanger. b) By throttling the sea water flow, or, alternatively, by-passing a proportion of it. c) By controlling the temperature of the sea water entering the heat exchanger—this is done in the sea water system as a whole, by spilling part of the heated discharge back into the pump suction. 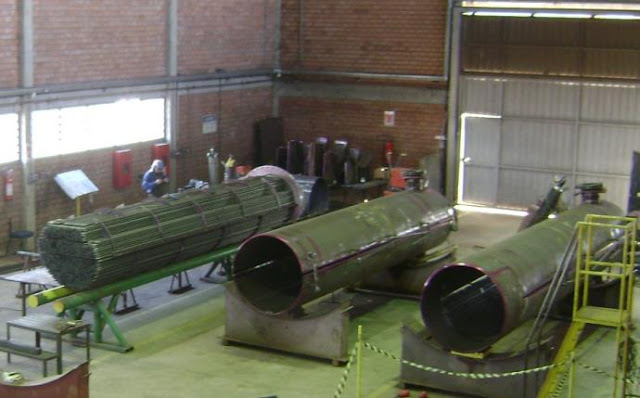 The only attention that heat exchangers should require is to ensure that the heat transfer surfaces remain substantially clean and the flow passages generally clear of obstruction. Indication that undue fouling is occurring is given by a progressive increase in the temperature difference between the two fluids, over a period of time, usually accompanied by a noticeable rise in pressure loss at a given flow. Fouling on the sea water side is the most usual cause of deterioration in performance. The method of cleaning the sea water side surfaces depends upon the type of heat exchanger. With the shell-and-tube type, the removal of the header covers or, in the case of smaller heat exchangers, the headers themselves, will provide access to the tubes. Obstructions, dirt, scale etc., can then be removed, using the tools provided by the manufacturer. Flushing through with fresh water is recommended before a heat exchanger is returned to service. In some applications, such as piston oil cooling, progressive fouling may take place on the outside of the tubes. Most manufacturers recommend a chemical flushing process to remove this in- situ, without dismantling the heat exchanger. 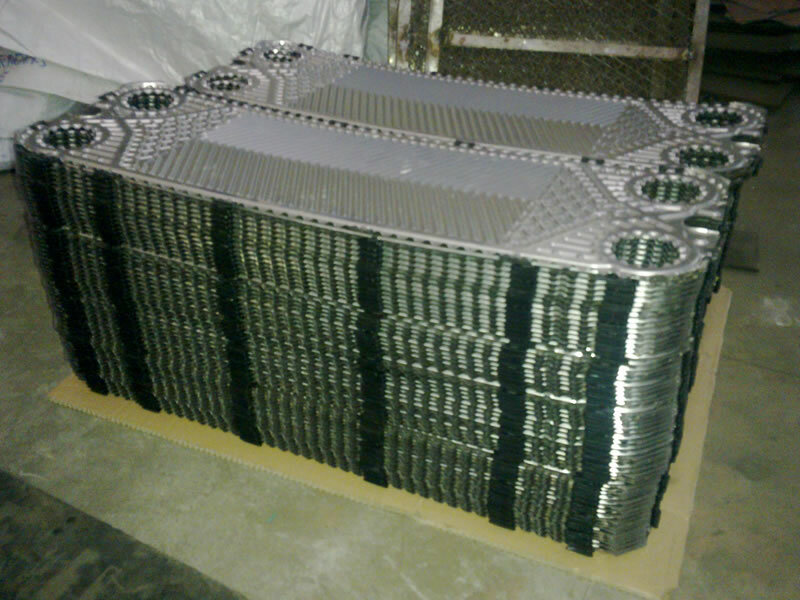 Plate heat exchangers may be cleaned by unclamping the stack of plates and mechanically cleaning the surface of each plate as recommended by the manufacturers. The plate seals may require replacement from time to time and here the manufacturers’ instructions should be closely followed. Although maintenance is a rapid, simple operation, the heat transfer plates must be handled with care. Corrosion by sea water may occasionally cause perforation of heat transfer surfaces. This will cause leakage of one fluid into the other but this is not always easy to detect whilst the leakage is small, although substantial leaks may become evident through rapid loss of lubricating oil, jacket water etc. Location of a perforation is a straight forward matter in the case of a tubular heat exchanger, whether this is of the shell-and-tube type or of other tubular construction. Having drained the heat exchanger of sea water and removed the covers or headers to expose the tube ends, some flow of the liquid on the other side of the surface will be apparent, in the case of oil and water coolers, from any tubes which are perforated. To test for leaks in air coolers drain coolers etc. each tube in turn can be plugged at each end and pressurized with air; inability to hold pressure indicates a leak. To aid the detection of leaks in a large cooler such as a main condenser, in which it is difficult to get the tubes dry enough to witness any seepage, it is usual to add a special fluorescent dye to the shell side of the cooler. When a ultra-violet light is shone on to the tubes and tube plates any seepage is seen since the dye glows with a vivid green light. In plate heat exchangers, the only way to locate leaks is by visual inspection of the plate surfaces. On docking for any protracted period, such as for repairs, refitting etc. it is advisable to drain the sea water side of heat exchangers, clean and flush through with fresh water, after which the heat exchanger should be left drained, if possible until the ship re-enters service.